Robyns Simple Life: Jimmie Johnson Dominates! 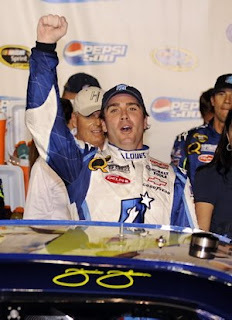 At the Pepsi 500 in Fontana California at the Auto Club Speedway August 31st 2008!.. Jimmie Johnson totally dominated the track. Johnson led all but 22 laps of the 250 lap race. He was unstoppable and unbeatable. Jimmie ran the Chevy Impala and it was as if the car had wings. At one point in the race after a pit stop one of his crew members got caught up in an air hose and it lost precious time for Jimmie to get back on the track and also lost him a few spots where he dropped to 6th place but in under two minutes, Johnson was back in first place and couldn't be caught. Biffle, who also ran an excellent race tried everything he could to catch Johnson but it wasn't in the cards. Johnson's car was the fastest on the track combined with his driving skill it was Jimmies night. Congratulations Jimmie on another outstanding run. Good luck next week at Richmond. We'll be watching!